Chronic diarrhea is a common problem for our furry companions. So too are constipation and diabetes mellitus for dogs & cats. All of these medical problems may benefit from increased dietary fiber. Many veterinarians recommend supplementing meals with canned pumpkin as a means of increasing fiber in the diet. Is this effective? Read this post to find out – happy reading! Pumpkin – What is fiber? Each of us has probably heard a healthcare professional tell us to eat more fiber. Eat more fruits and vegetables. Eat more legumes (e.g. : beans, nuts, peas, and lentils). But do you know why fiber is considered healthy? Dietary fiber – also called roughage or bulk – is composed of parts of plant foods the body can’t process or absorb. In contrast to protein, fats, and carbohydrates, fiber isn’t digested by bodies of dogs and cats (and humans). Fiber is classified as either soluble or insoluble. Soluble fiber dissolves in water to form a gel-like material. Common examples of foodstuffs with a lot of soluble fiber are carrots, psyllium, barley, oats, peas, and beans. Doctors recommend this type of fiber to help control blood glucose/sugar and lower cholesterol. Insoluble fiber doesn’t dissolve in water and promotes movement of material through the intestinal tract. The bulk of bowel movements also increases. Common examples of foods with meaningful insoluble fiber are potatoes, cauliflower, and wheat bran. Most plant-based foods have both soluble and insoluble fibers, and pets often benefit from a wide variety of high-fiber foods. Pumpkin – What about cats? Some of you cat lovers out there maybe thinking I’m crazy talking about plant-based dietary fiber and cats together. After all, cats are obligate carnivores. While it is true cats have little to no need for plant-derived fiber, animal fiber is considered an important component of health diets for strict carnivores. Animal sources that act as “fiber” (in that they aren’t digested) are fur, bone, cartilage, tendons, and ligaments. 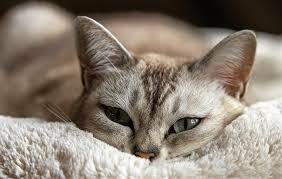 It has been reported the natural diet of cats – chiefly rodents and birds – contains 0.55% fiber. For example, wild and domesticated cats ingest plant-derived fiber found in the digestive tracts of their prey. Many commercial cat foods contain up to 10% plant-derived fiber. There are many reasons for this difference in fiber content, including availability of animal-derived fiber sources and cost. Unquestionably, further study is needed to know if plant-derived fiber is an adequate substitute for animal-derived sources. Pumpkin – What’s the truth? The amount of fiber in pumpkin is essentially minuscule. Specifically, there’s 0.6 grams of total dietary fiber in one cup (116 grams) of pumpkin. 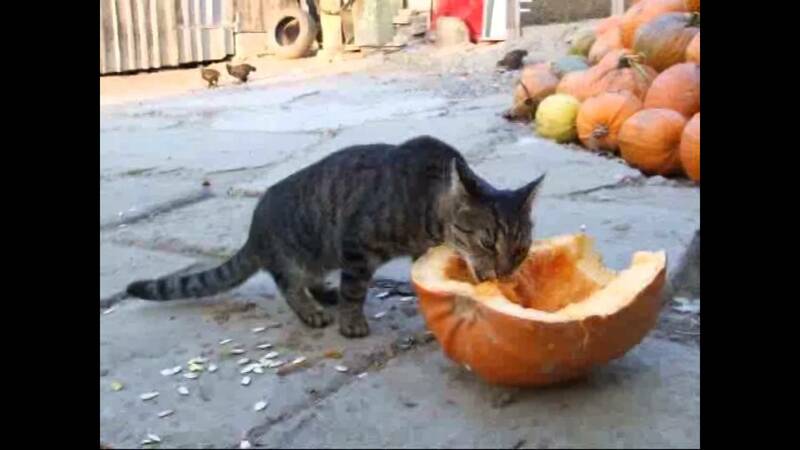 Practically speaking, you would need to feed a cat almost three cups of pumpkin per day and approximately one dozen cups to a medium-sized dog to match the fiber content of commercially-available “high fiber” diets. That means the 1-2 tablespoons of canned pumpkin you add to your pet’s meal is essentially nothing more than a tasty treat. 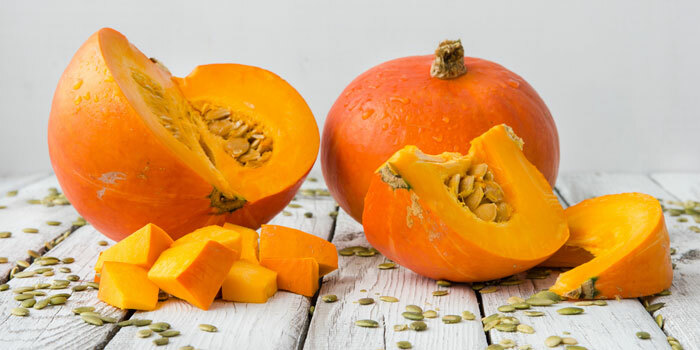 Pumpkin is a plant-based source of both soluble and insoluble fiber. If you’ve ever looked at a pet food label, you know they can be downright confusing. 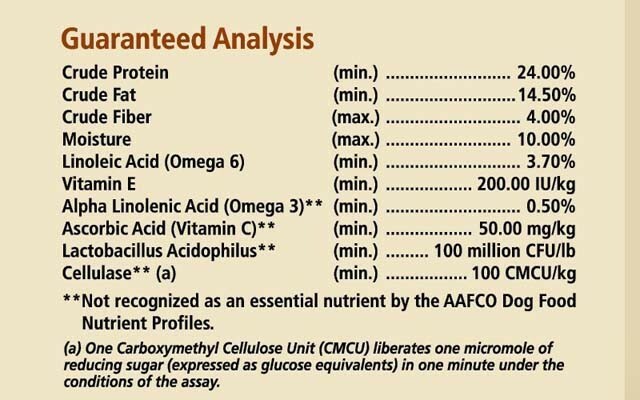 The fiber information listed is called crude fiber and is a required component of the guaranteed analysis of the food. Unfortunately, crude fiber is not the same as total dietary fiber. Indeed, crude fiber is only insoluble fiber, and thus pet food labels are misleading regarding a diet’s fiber content. Pet parents also need to pay attention to some other aspects of canned pumpkin, most notably calorie and sodium (salt) content. Pumpkin pie filling contains many more calories per cup compared to simple canned pumpkin (~280 calories vs. ~80 calories). Canned pumpkin also comes in salted and unsalted varieties. High sodium content may be harmful to those certain heart and kidney conditions. 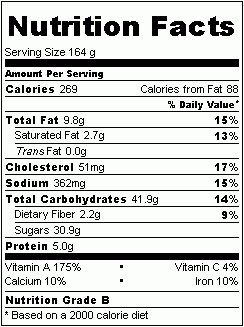 Typical nutritional label for canned pumpkin. 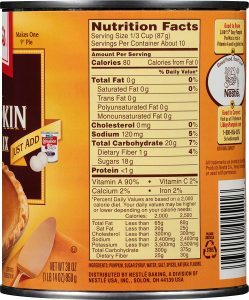 Nutrition label for a commercially available pumpkin pie mix. Note the higher caloric and sodium content compared to the canned pumpkin product shown above. Pumpkin – WHat should I do? The best source of nutritional information is from a veterinarian. You can even consult with a board-certified veterinary nutrition specialist to ensure your pet is receiving the most appropriate diet for their nutritional needs. There are so many other fiber supplements that may be used to meet your pet’s dietary fiber needs. Believe it or not, the online webpage run by Mrs. Smith about her dog and her beliefs about her pet’s diet is probably not the best place to go for nutrition advice. Opinions expressed on such pages and online forums are just that…opinions. Don’t believe the ridiculous urban legend veterinarians are paid off by the big pet food companies. In more than a decade and a half, I’ve not received a red cent from any pet food company to promote one of their diets. That’s just not how things are done. These companies invest billions of dollars into research conducted by animal nutrition scientists and board-certified veterinary nutrition specialists to ensure the quality of their various diets. It’s time to stop trusting catchy marketing campaigns and once again embrace the expertise of your pet’s doctor for nutrition advice. Supplementing your pet’s meals with canned pumpkin is a common recommendation to enhance dietary fiber content. Such supplementation likely does little to meet that goal due to the minimal amount of soluble and insoluble fiber found in it. Pet parents are encouraged to speak with their family veterinarian for more effective means of adding fiber to their pet’s diet. Furthermore, they will likely find it helpful to partner with a board-certified veterinary nutrition specialist to ensure their pet’s diet is optimized for their health.